We had a festive Thanksgiving celebration with the kids this year. My DIL Kristen is a creative cook and likes to shake things up a bit. 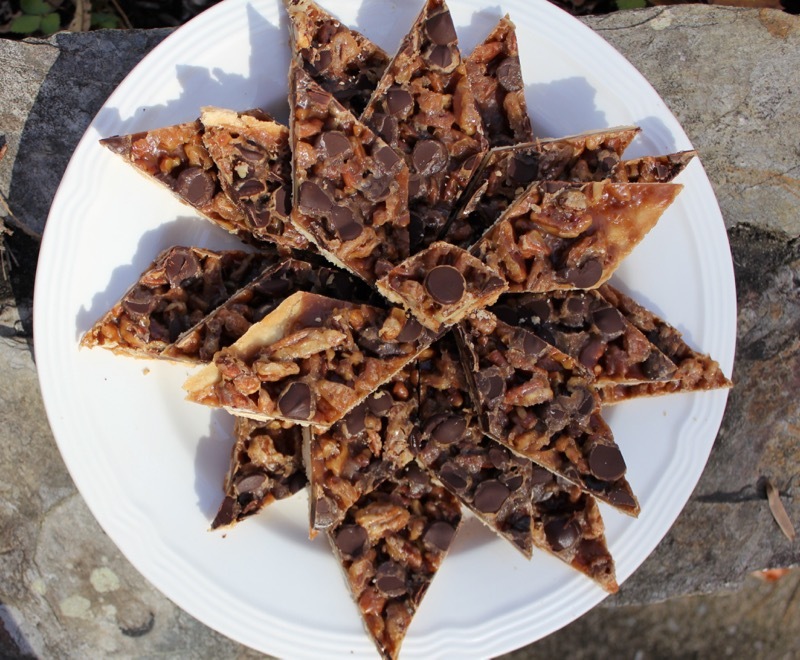 Instead of a traditional pecan pie, she made these Chewy Pecan and Chocolate Diamonds. The original recipe came from Epicurious. The shortbread crust is topped with a caramel pecan topping. To make it even more delicious, Kristen added chocolate chips to the final baking. We loved these bars. By cutting them into diamond shapes, there are edge scraps left for the cook and other family recipients. Your guests or gift receivers can have the pretty ones, but the scraps are a treat just for you. I will be making these as Christmas treats. 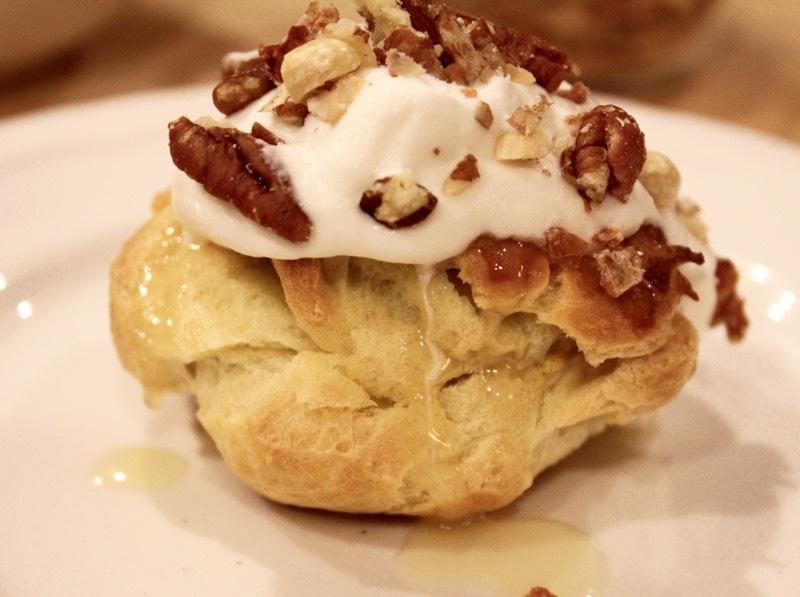 Instead of Pumpkin Pie, we had Pumpkin Custard Profiteroles with Maple Caramel. 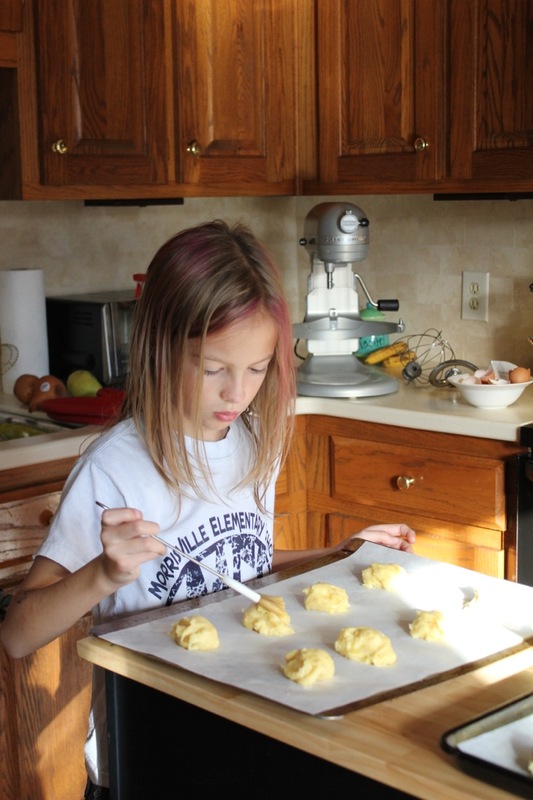 Rachel helped her Mom make these amazing cream puffs. 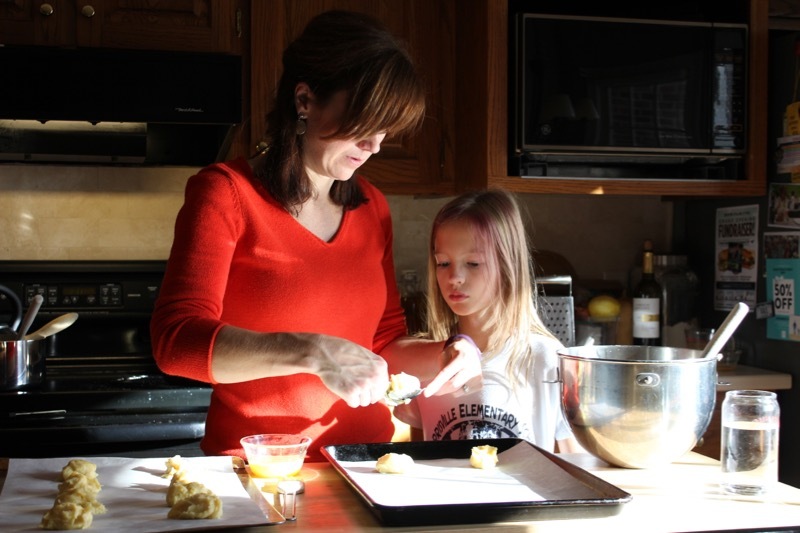 It is great to have the kids participate in the meal preparation. Four year old Cameron also got into the act by helping with the pecan diamonds. 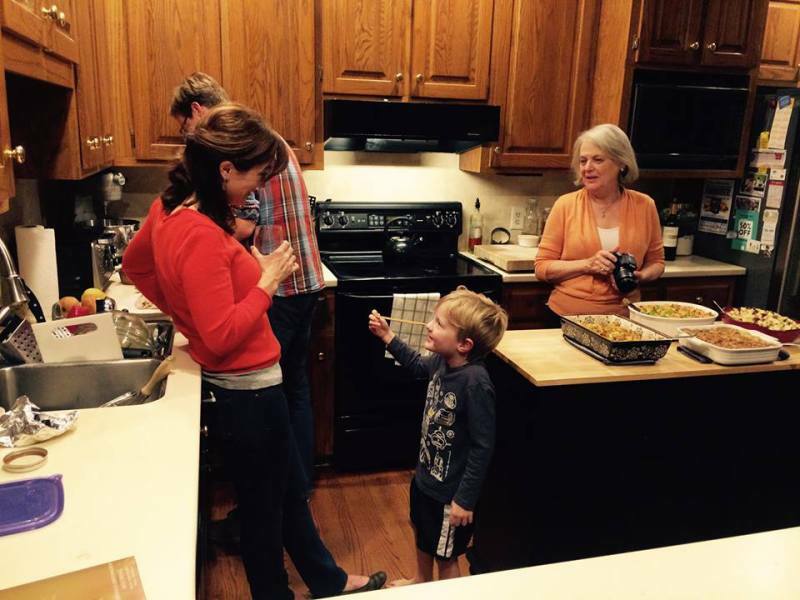 As the casseroles came out of the oven, Michael carved the turkey and we sat down to our delicious meal. I am thankful for my family and for all of you who follow my blog. To get you into the Christmas spirit watch this video of Rachel. She is a new member of a competitive jump roping team and shows lots of talent. https://youtu.be/ly-yG94eqBU Here is another one https://youtu.be/QQJBbWjG-F4 Our dog, Daisy seems to be enjoying the show. Rachel’s team will be performing at Disney World and possibly at next year’s Macy’s Thanksgiving Day Parade. For variation, add 1 cup of chocolate chips sprinkled over the top near the end of baking time. So glad you has a nice Thanksgiving, Penny. We missed seeing you. Your timing was perfect in putting this recipe on your blog. Kristen brought some to Kim’s house on Friday and I am planning to make and enter them in my cookie contest at work. They are delicious! The Chewy Pecan and Chocolate Diamonds make the prettiest poinsettia. I love to see young ones in the kitchen. I remember helping my Grand. I had forgotten until I started blogging and it has brought back so many memories. The diamonds look delicious Penny and good that you had the family time. Can’t get those kids in the kitchen too soon. Hahaha…4 yr old Cameron also got into the great jump rope act 2:) Jumping on the couch..so cute..
No wonder Rachel is so fit and trim.I am buying a jump rope. These looks so yummy, I’m going to try them! And I love your family pictures. Two yummy recipes, Penny! My mother made a diamond shaped cookie..always loved it when she cut them, because those corners always were left for us! What a fun and delicious Thanksgiving you had! 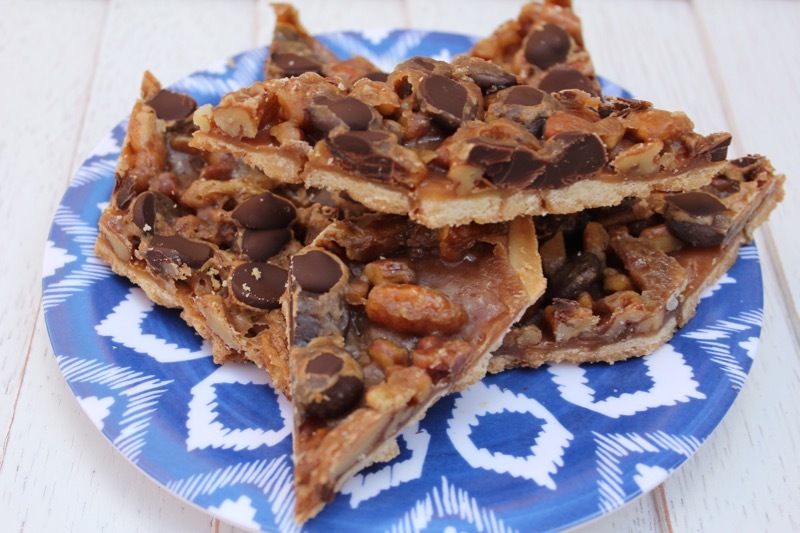 The pecan and chocolate diamonds look amazing and would love to try those for a Christmas cookie tray. What a clever idea with the pumpkin custard profiteroles too! Your right, your DIL is very creative. Look at Rachel go! Good luck to her and her team at Disney World. You can just see the concentration in her face 🙂 I love how the brother got into the act too. So cute! How nice. It sounds like you had a lovely Thanksgiving with your family. I know that everyone must have enjoyed the delicious day. A lovely family indeed, one that you are blessed with, may you always have happy days together. Liked the twists you’ve been making for the traditional pies 🙂 … Sharing this on FB immediately. Thanks for the recipe, I like your blog a lot. This post was published by Penny on November 29, 2015.